Our digestive track is a long involuntary muscle that, when displaced, constricted, ballooned, prolapsed, congested, (constipated), etc. causes problems not only with its own function but throughout the entire body. Acid reflux, hiatal hernia, liver toxicity, weight gain, abdominal distention and problems with the bladder, uterus, prostate as well as chronic hip, and lower back problems and heart attacks begin in the gut. The remedy is simple and cheap, and when done on a nightly basis often results in many improvements including weight loss. 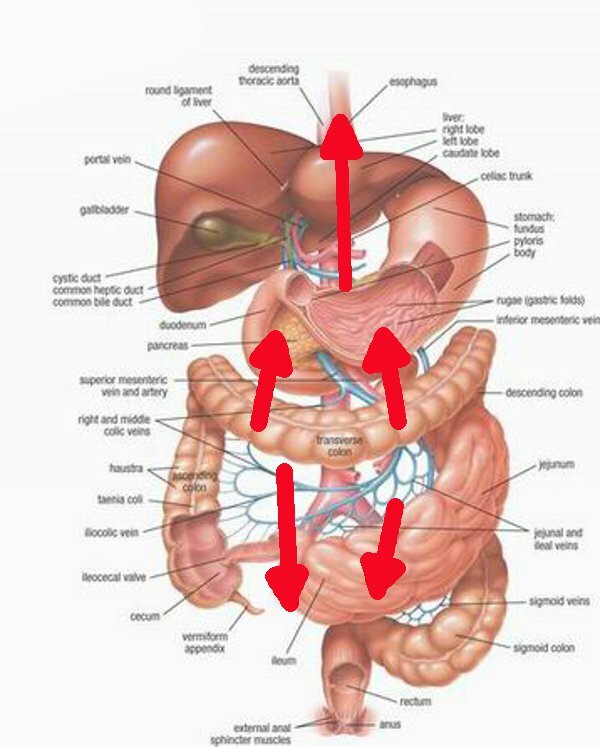 The organs within our gut are supported by sheets of connective tissue supported where they function best. Displacement of viscera due to abdominal distention. This creates many problems that are easy to resolve with the Abdominal Massage. In ideal health, all the organs can move as needed (expand and contract), AND, all the fluids (blood, lymph, bile and other secretions) can flow freely to their destinations. The major contributor to this disorganization is intestinal congestion caused by eating too much at one time, or, stress shut-down resulting in constipation and/or gas accumulation, even in children. Another major contributor is any abdominal surgery which results in adhesions and scar tissue within the gut. Some indicators that this has happened are distention (mild) to hernias (abdominal or a hiatal). Well if pressure is being exerted outward (distention) is it unreasonable to assume that these pressures are acting internally? A MAJOR impact on our health of these things is the disruption of blood flow due to the pressure of these organs on arteries or veins or one another. When blood flow is impaired, can pain and disease be far behind? A result of upward pressure of the distended intestines is the hiatal hernia, where the intestines push up on the stomach from below, pushing it into the diaphragm causing a constriction of the upper part of the stomach and forcing the esophagus toward the throat, resulting in difficulty swallowing. This upward pressure can cause acid reflux AND also can cause heart symptoms. This massage will help. A result of downward pressure of the distended intestines is lowered bladder volume and thus frequent urination or even incontinence. Downward pressure also impairs the circulation in the lower pelvic cavity as well as to and from the legs causing prostate problems, varicosities, restless leg, swelling in the feet/ankles and leg numbness. This massage will help. A result of backward pressure of the distended intestines is lower back pain as well as hip pain from the pull of the sheets of connective tissue on their attachments on the rear abdominal wall. This massage will help. The Abdominal Massage is based on an ancient Mayan massage which was used for everything from headaches and constipation to infertility (male or female), an indication that these are not just problems of modern man. I have made several adjustments, one of which is dividing the program into a beginner and an advanced section to target specific problems. Proceed slowly and cautiously because your abdomen will respond with gentle manipulation. There is NO benefit to being aggressive here. You may also find that after working up to the ‘full advanced version’ that there are certain parts of it that are more effective for you and you can create your own ‘short targeted version’. If you have difficulty because of hand/wrist/arm pain or weakness, consider using the vibration massager. Just place it lightly upon the tummy and the vibrations will propagate into the tissue and encourage blood flow and relieve stagnation. Then keep moving it to other positions. Barral JP, Mercier P. Visceral Manipulation. Vista, CA: Eastland Press 1992. I have been loving this website. Thank you for the work that went into it. It makes SO much sense. God’s design is amazing! I am wondering if the abdominal massage is effective through excess fat or if there is a certain way to handle it. I’m working on losing (20 down but 80 to go) but have a significant belly as well 6 pregnancies of stretching to contend with. Working on reducing stress is my first prioroity. I am hoping the changes I am making will help overall. I was looking at your abdominal massage and was wondering if it is the same as the Arvigo technique. Over the years I have looked at it and have thought about going for training. What do you think about that? I took a class years ago. I picked through what I felt worked and rearranged it and came up with my own. There are modern/western courses on visceral massage but I like the more ancient techniques. Many cultures have them and they have been handed down because they work. i was lifting heavy weights..
suddenly a pricking pain developed in my left of the abdomen by which side of hand i was doin workout…..
for once i thought its hernia.. so i went to hospital… nd did sonography…. bt its been 15 days… nd sometimes a day i feel pain in my left lower back.. left joint and also in my left testis…. i went to other 2 docs nd again did sonography nd x ray of my hip… nothing abnormal recorded bt the pain still persists…… i feel my inguinal ligament stretch at the pubic symphysis end sometimes when m standing…. and yaaa…. the swelling appears when am standing… bt disappears when am lying down…. for once m thinking if any of my vicera got displaced causing pressure at my inguinal ligament…. To me it sounds like you may have created a hernia but perhaps not where the tests can see it. A wonderful (almost magical) formula for these types of situations is PLS II. You need to take a lot though. 6B, 6D for 2 weeks and you should be able to tell a difference. Then just continue at 4B, 4D for about 6 weeks. Pat – Any recommendations if I suspect I have appendicitis?